Prof. Ejiofor laments that a great number of Igbo leaders can never ever be seen taking the Igbo language issue seriously. The passion in the man was like a charge of electricity. Prof Pita Ejiofor may look calm but when the subject is the neglect of the Igbo language calmness gives place to passionate intensity. The celebrated professor was introduced to me in Awka by the Anambra State Commissioner for Information and Public Enlightenment, C. Don Adinuba, and almost instantly our discussion gravitated to the vexed matter of the travails of the Igbo language. 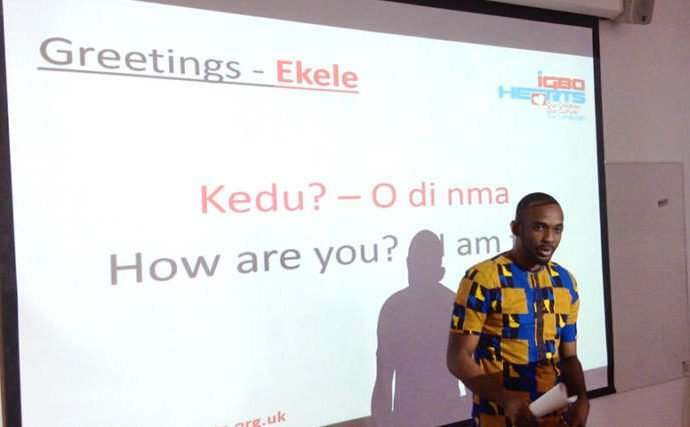 Prof Ejiofor had served in esteemed positions as commissioner, vice chancellor and so on, but what gives him the greatest oomph is the drive to save his beloved Igbo language from extinction. He has arduously championed the cause for all of 12 years through his group Otu Suwakwa Igbo that he initiated on February 14, 2006. He laments that a great number of Igbo leaders can never ever be seen taking the Igbo language issue seriously. Prof Ejiofor points out that Igbo people are fond of lionizing those who speak big English grammar. He reveals that the neglect of Igbo language started a long time ago. He cries out that it does not bode well for the Igbo that there is hardly any surviving Igbo language newspaper. The first newspaper in Nigeria, Iwe Irohin, was established by the missionary, Henry Townsend, in Abeokuta in 1859. The world’s first Hausa language newspaper, Gaskiya ta fi Kwabo, was set up in 1939 in Kaduna. The first Igbo language newspaper is an issue of controversy that needs not detain us here. It just suffices to state that as at today the one surviving Igbo newspaper is an insert, Ka Odi Taa, in the weekly National Light newspaper published by the Anambra State Government. Prof Ejiofor highlights the use of language as a unifying factor in the North by Sir Ahmadu Bello when he championed the cause of “One North” through the use of a common Hausa language amongst the disparate ethnic nationalities of the vast region. Incidentally, BBC Hausa Service and VOA Hausa Service flowered for such a long time before the modern-day advent of the Yoruba and Igbo versions. Prof Ejiofor readily supplies the date of the start of BBC Hausa Service as March 15, 1957. Prof Ejiofor had to somewhat make an intervention. He got a call from the BBC on April 3, 2016 that its emissary would come to meet with him. On April 16, 2016, the BBC Chief Correspondent Mike Callaghan came to Prof Ejiofor’s house in Awka. BBC Igbo Service and BBC Yoruba Service kicked off live broadcasts on February 19, 2018. “The Igbo and the Yoruba need to sustain the stations in healthy competition,” he advises. Prof Ejiofor cites the initiative of the Lagos State Government on the mandatory issue of scoring a credit in Yoruba before any candidate can be admitted into the state’s institutions of higher learning. “There is no such law in the Southeast,” Prof Ejiofor asserts. He divulges the trickery of some students using Igbo to gain entry into the university only to change their course of study later. Some of the students used Igbo to earn admission into the university just to satisfy the ego of being in the university, even as they were on campus re-taking “JAMB” to study a “better” course! “We made sure nobody changed to any other department once he or she had been admitted to study Igbo!” he stresses. He cites the exemplary role of the Igbo politician and business mogul, Godwin Ezeemo, who for three years sponsored the competition of the making of Igbo VCDs for which Nze Uche Nworah, the CEO of Anambra Broadcasting Service (ABS) served as chief judge. Born on September 19, 1941 in Obeledu, Anambra State, the 2004 Nigeria National Order of Merit (NNOM) winner is married with five children. He believes in the promotion of higher ideals like education over crass materialism in the Igbo landscape. “I have travelled everywhere promoting the speaking of Igbo language,” Prof Ejiofor concludes.